Dr. Maria Montessori was a medical doctor and teacher who lived from 1870 – 1952. She was remarkable for her time because she was the first woman in Italy to receive a medical degree. After graduation she worked with patients with nervous and mental disorders, and later with mentally challenged children. It was at this time that she made some wonderful discoveries about the ways that children learn. She described the ages from 3 to 6 as a particularly sensitive time during which young children are especially in tune to acquiring knowledge from and about their environment. In 1907, she opened the first Casa Dei Bambini (Children’s Home) in Rome. In this and the following educational facilities she established, she developed a process of education that enabled children of all ages and abilities to attain excellent academic levels. She devoted the rest of her life to the education of children, and her education system became a model for educators throughout the world. As of today there are approximately 4000 Montessori schools in the U.S. alone and about 20,000 established Montessori schools worldwide. Montessori system of education is both a philosophy of child growth and a rational for guiding the growth. It is based on the child’s developmental needs for freedom within limits which teaches independence and respect. It mandates a carefully prepared environment that guarantees exposure to materials and experiences that develop intellectual along with physical and psychological abilities. It is designed to take full advantage of the self-motivation and unique abilities of young children to develop to their own best capacity. Children need adults to expose them to the limitless possibilities that exist in their world, and then to let them grow to experience the joys of learning. This in itself truly gives a child the joyful peace he/she desires. Children are respected as different from the adults, as individuals who differ from each other and each possess unique qualities and abilities. Children possess unusual sensitivity and mental powers for absorbing and learning from their environments that are unlike those of adults both in quality and capacity. Children have a deep love and need for purposeful work. The child works, however, not as an adult for profit and completion of a job, but for the sake of the activity itself. It is this activity that accomplishes the most important goal for the child: the development of his or her mental, physical and psychological capabilities. A. Montessori emphasizes learning through all five senses, not just through listening, watching, or reading. Children in Montessori classes learn at their own individual pace and according to their own choice of activities from hundreds of possibilities. They are not required to sit and listen to a teacher talk to them as a group but are engaged in individual or group activities of their own, with materials that have been introduced to them individually by the teacher who knows what each child is ready for. Q. Why does Montessori have multi age classrooms? A. Multi age classrooms provide the opportunity to adapt the curriculum to the individual child. Each child can work at his/her own pace while remaining in community with his/her peers. In addition, the multi age format allows the older children to be the leaders of the classroom community, even those shy or quiet children. The younger children have several models to look up to as they begin learning new tasks, while the older children are filled with feelings of importance and confidence. A. Research studies show that Montessori children are well prepared for later life academically, emotionally and socially. They score extremely well on standardized tests and are ranked above average in the following areas: following directions, turning in work on time, listening attentively, showing responsibility, adapting to new situations, showing enthusiasm for learning and asking meaningful questions. A. No. Montessori educates children without reference to any religious denomination. As a result, our classrooms are filled with students and faculty from diverse cultures and backgrounds. 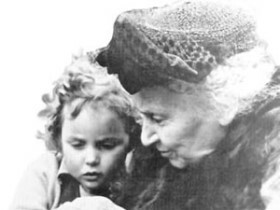 A. Dr. Montessori founded Association Montessori Internationale in 1929 to preserve her legacy. Today, in the United States several Montessori associations exist such as AMS, AMI, NCME and MACTE which provide new teacher training and continuing education programs for teachers and school accreditation. Q. How do you ensure that children receive a well rounded education if they are free to choose their own work? A. Montessori children are free to choose within limits, and have only as much freedom as they can handle with appropriate responsibility. The classroom teacher and aides ensure that each child is progressing at his/her appropriate pace in all subjects. Q. Montessori classrooms don't look like regular classrooms. Where are the rows of desks? Where does the teacher stand? A. The different arrangement of a Montessori classroom matches the Montessori method’s differences from traditional education. Rather than putting the teacher at the focal point of the class with children dependent on her for information and activity, the classroom arrangement demonstrates this child centered approach. A. Yes. Rather than implementing repetitive techniques to introduce abstract concepts such as addition and subtraction using memorization, flashcards, worksheets, etc., the Montessori Method directs the understanding of these abstract concepts through hands on application and self-discovery. The success of our students is visible in the experiences of our alumni, who compete successfully with traditional educated students in both high schools and universities.